. . . started as a thesis project on the topic of feminism in the Masters in Branding program at the School of Visual Arts in New York City. We tend to think of brands in strictly aesthetic and financial terms — but so much of branding has to do with building awareness, shifting perceptions, and galvanizing action. What if we utilize these skills to examine our societal constructs and help promote important movements? In a culture that is rife with political and social issues, framing activism through the branding lens is not only welcome, it is necessary. Our research on the current state of feminism uncovered a conversation full of confused and conflicting opinions — one where no one could seem to agree on the meaning of the term. One of the challenges we faced was the word itself, which specifically refers to females from a semantic standpoint. 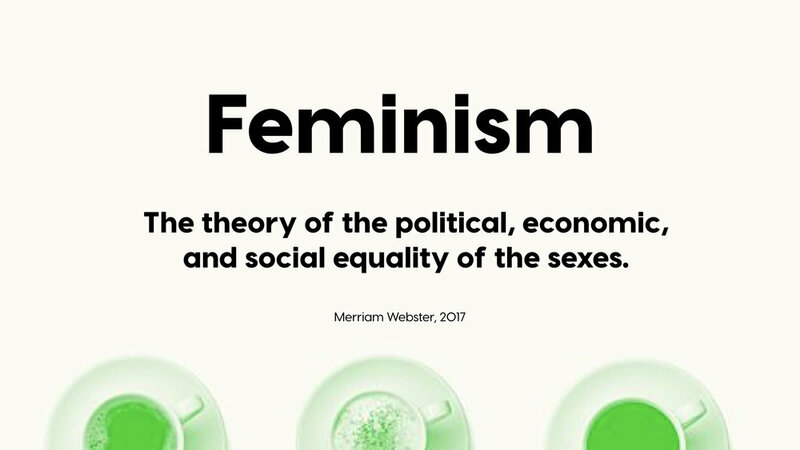 However, in 2017, when Webster's Dictionary made 'feminism' their word of the year, the definition changed to no longer include the word 'female'. Through in-depth interviews with scholars and thought leaders from within the feminist movement, we concluded that social, political, and economic freedom from gender discrimination isn't a female issue, but rather a human issue. Therefore, all genders must be included in the conversation. We took it upon ourselves to create a system that would allow people to publicly show their alignment with the cause of gender equality, without having to use the feminist label — resulting in the visual identity for our organization. Our identity is an ellipsis, which represents a continuation of the work to be done. It symbolizes the connection between the struggles of the past and our vision for the future. While honoring the history of the feminist movement, we will continue to move forward until we have reached gender equality for all. The simplicity and ubiquity of the ellipsis means that you can take our identity and make it your own — by showing solidarity in a way that fits your style.